For the first time all EEMA member agencies and partners will be coming together along with their families for a day full of fun and excitement. 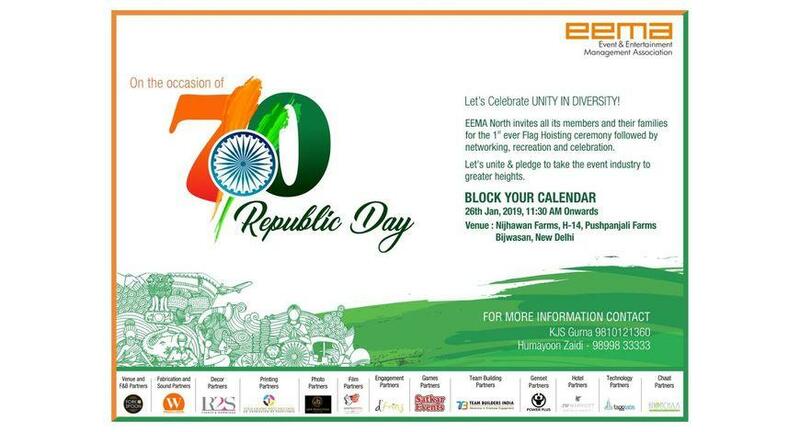 Event and Entertainment Management Association (EEMA) North is planning to host one of the first ever Republic Day Celebrations this year. It is a first of its kind event planned for EEMA members and partners. For the first time all EEMA member agencies and partners will be coming together along with their families for a day full of fun and excitement. Vipul Pandhi, Vice President North stated that Republic Day and Independence Day should be celebrated in a big way, the way we celebrate Holi & Diwali. "Unfortunately, these days of national importance are no more than a holiday and treated as just another day off from work. We intend to initiate a change wherein these days grow to become one of the biggest celebrations of national pride and unity in the country," he said. As per KJS Gurna, Treasurer EEMA, the excitement level among members to be a part of this event is overwhelming. The number of confirmations already received is far exceeding the initial estimates.